As a generality, a healthy stock market up trend has broad participation in the trend by a large or increasing portion of its constituents; and conversely an unhealthy market has a low or declining portion of it constituents participating in an up trend. That logic can be referred to as breadth analysis. Broad or increasing breadth indicates a strong or strengthening market, while narrow or decreasing breadth indicates a weak or weakening market. There a variety of ways to get at the question of breadth, such as studies of new highs and lows, price advances and declines, volume advances and declines, percentages of index members above selected moving averages, percentages of members with Bullish Point & Figure charts, and some others. In this article, we look at the relative performance of equal weight versions of indexes, versus the primary market-cap weighted versions of indexes. Market-cap weighted indexes heavily reflect the price action of the largest constituents (e.g. Apple is 4% of the S&P 500), while equal weight indexes treat all constituents the same (e.g. Apple is 1/5th of 1%% of the equal weight S&P 500). Therefore, market-cap weighted indexes mask the underlying strength of the broad membership of an index. if market-weight index is rising, and the equal weight index is roughly tracking the market weight index, the trend is stable. For falling market-cap indexes, the converse logic may not be quite as clear in each scenario, but clearly a falling equal weight index accompanying a falling market-weight index is a confirmation of the market-weight index decline. 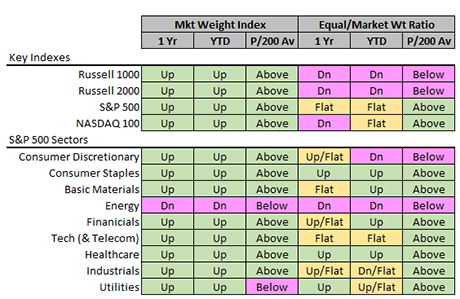 The Russell 1000 large-cap and Russell 2000 small-cap indexes are rising (as measured by the slope of the 200-day average over 1-year and YTD, and by the position of the price above or below the 200-day average); however, the ratio of the equal weight index to the market-cap weighted index is declining, indicating a weakening of the market-cap index up trend. The S&P 500 is also in an up trend, but the ratio of the equal weight to market weight indexes is a bit flat, putting somewhat of a question mark on the power behind the primary market-cap index up trend. The NASDAQ 100 is in an uptrend too, and its ratio of the equal weight to market weight indexes is a bit weaker than for the S&P 500, also putting a question mark on the power behind the market-cap index. Considering the Russell, S&P and NASDAQ indexes as a group, it appears that the overall uptrend is running out of steam. Within the S&P 500, the strongest support from the equal weight to market-cap weight ratios is for Healthcare and Consumer Staples; with Basic Materials and Financials as a second tier. No surprise, Energy is in the worst shape. We made the ratings by visual inspection of charts which are provided below. You can judge for your self how they should be rated. 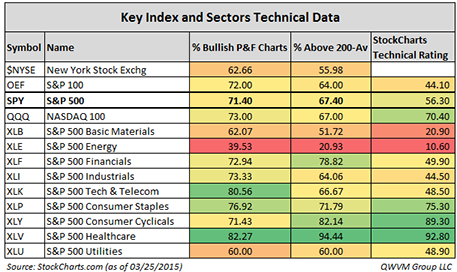 As a cross check we looked at the sectors through two other breadth indicators, plus the technical rating from StockCharts.com. For breadth we looked at the percentage of index members with Bullish Point& Figure Charts and the percentage of members with prices above their 200-day average. That data confirmed Healthcare as strong, as well as Consumer Staples, but contrary the equal weight to market weight indicator, it shows Consumer Discretionary as strong. Also contrary to the equal weight to market weight indicator, it shows Basic Materials to be weak, and Financials to be so-s0. All agreed that Energy is in the tank. Which indicators are better forecasters is unknown, but it’s good to have multiple angles of attack to the question of trend strength. 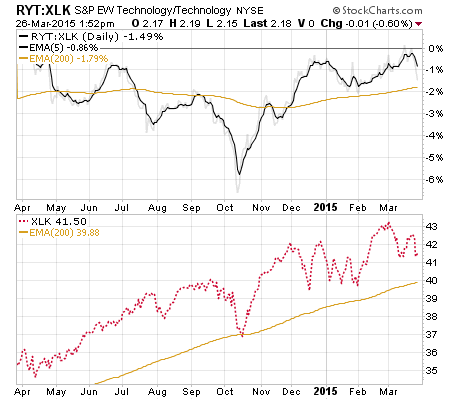 Taken all together, this data suggests the broad stock market indexes are getting a tired. Don’t forget that even the best stocks have a hard time staying up when the broad market decides to go down. While some return could be left on the table, prudence might suggest holding some tactical cash, against a market correction that seems overdue, subject to some high profile trigger event on the horizon (such as Fed beginning to raise Fed Funds Rate, or worse results from Q1 due to Energy sector or strong Dollar, some new turmoil in Europe, or a wider war in the Middle East). For those following trends, Healthcare and Consumer Staples may be the best place to be; although arguments about potential overvaluation need to be considered. For those seeking bargains, a lot of patience, tolerance of short-term pain, and a conviction that oil will recover to the $60-$80 range, Energy may hold some opportunities. Each chart below shows in the top panel the ratio of the equal weight ETF price to the market weight ETF price (shown as the 5-day EMA in black), along with the 200-day EMA in gold. In the bottom panel, the market weight index is plotted in blue with its 200-day EMA in gold. 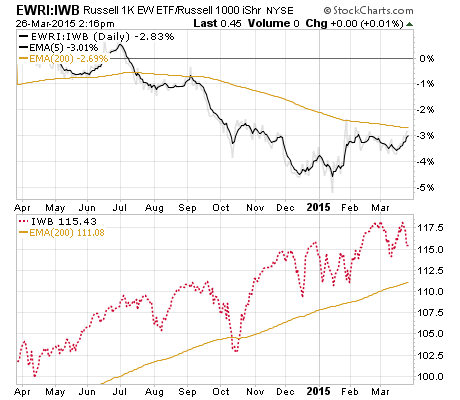 Main index (IWB) trend line is rising, but breadth trend line (EWRI equal wt / IWB market wt) is deteriorating. 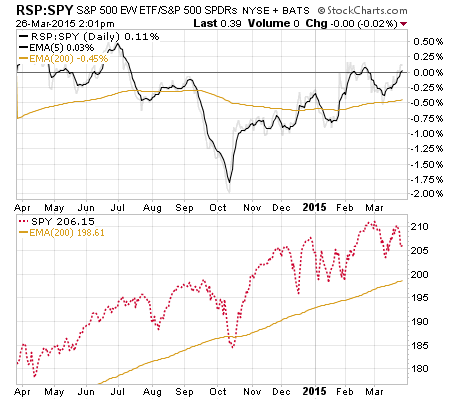 A little pick-up in breadth in 2015, but breadth trend line (200-day EMA) is rising YTD. 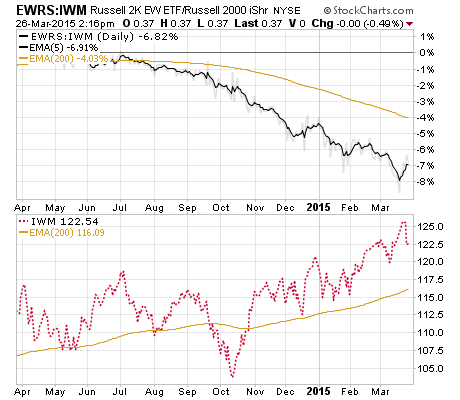 The main index (IWM) is rising, but the breadth trend (EWRS / IWM) is deteriorating. 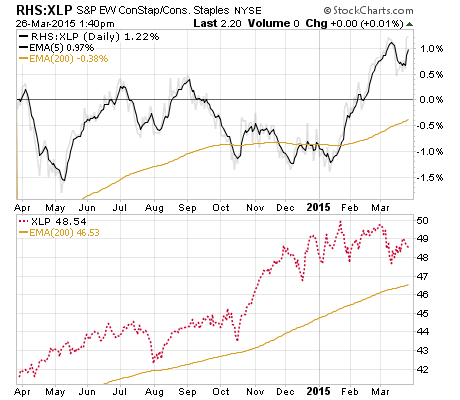 The main index (SPY) is rising, and the breadth index trend (RSP / SPY) is about steady. The short-term, 5 day breadth took a dive in October 2014, but not enough to divert the flat breadth trend line. 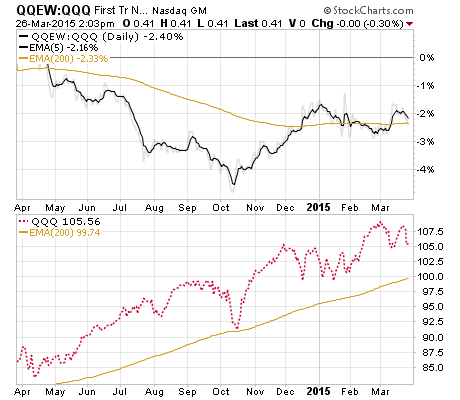 The main index (QQQ) trend is rising, and the breadth indicator trend (QQEW / QQQ) deteriorated in 2014, but has stabilized YTD. The main index (XLY) trend is rising, and the breadth trend (RCD / XLY) is generally steady, but the 5-day breadth is down YTD. The main index (SPY) trend is rising, and the breadth trend (RHS / XLP) is also rising. 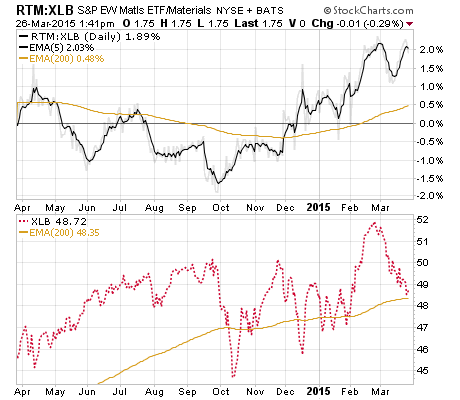 The main index (XLB) is rising and the breadth index (RTM / XLB) is rising since December 2014. 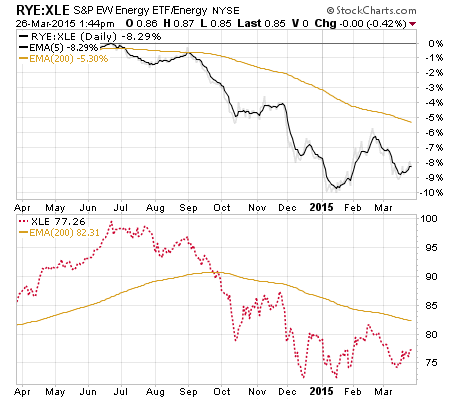 The main index (XLE) trend is declining and the breadth trend (RYE / XLE) is also declining. 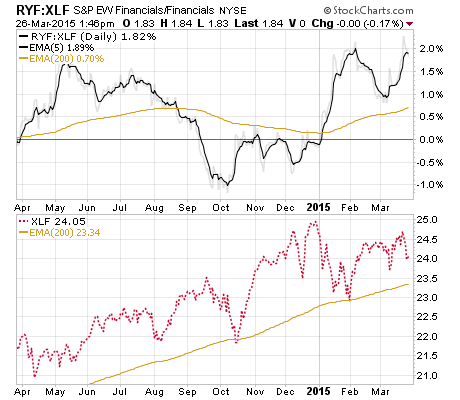 The main trend (XLF) is rising, and the breadth trend (RYF / XLF) is rising slightly in 2015. 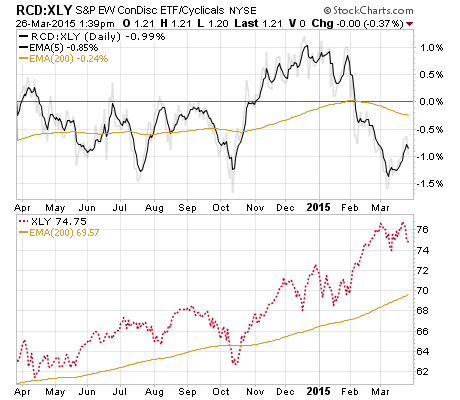 The main index (XLK) trend is rising, but the breadth trend (RYT / XLK) is basically flat. 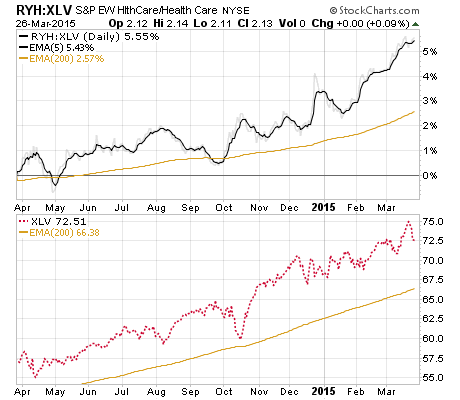 The main index (XLV) trend is rising, and the breadth trend (RYH / XLV) is rising strongly, with the 5-day EMA well above the 200-day EMA. 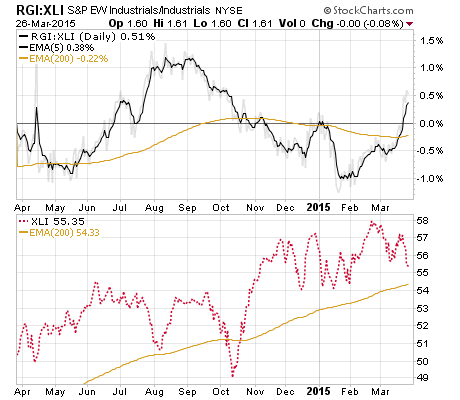 The main index (XLI) is rising, but the breadth trend (RGI / XLI) is mostly flat, with a strong improvement in 2015. 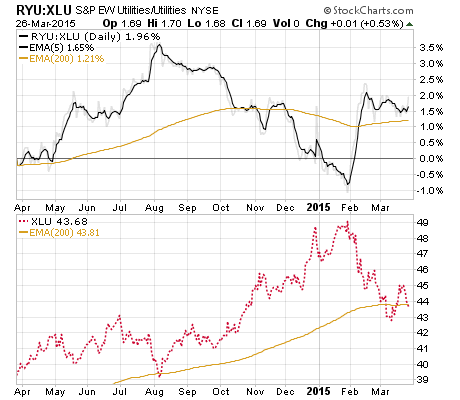 The main index (XLU) trend has been up, but is flat now, and the breadth trend (RYU / XLU) is also flat. This entry was posted on Friday, March 27th, 2015 at 10:41 AM and is filed under market outlook. You can follow any responses to this entry through the RSS 2.0 feed. Both comments and pings are currently closed.